We stayed on the Somme as long as possible because we loved it, but in the end we had to come back to Peronne, our starting point. Although we can set our own agenda and decide each day what we will do, we do have a few social obligations and appointments that cause us to be at a certain location at a certain time. In this case we had made an arrangement to meet up with fellow DBA-members to meet in Péronne. August, 12th we took our leave from the Somme, mixed feelings. Sad because we had a marvellous time and cheerful because of the new experiences that lay ahead. We were not to be disappointed. This picture shows Rebecca on the Somme, getting a bit of experience; it’s a great river with all its curves and locks to learn to handle the barge and she’s not doing badly at all! No need to tell me, I can see it all! We went on the Canal du Nord, heading South as far as Pont l’Eveque. Here we went through a tunnel for the second time, the Tunnel de Panneterie (1,06 km), not as long as the Tunnel de Ruyalcourt (4,5km), but narrower. One floodlight, two torches and one person on each side and all went well. Alas, this was no harbinger for what was to come. In Pont l’Eveque we left the Canal du Nord, being out of the way of the bigger commercials (on the Grand Gabarit), dimensions being restricted now to 38,5 m length and 5,05 m width. On the junction of the Canal du Nord en Canal latéral à l’Oise some 15 or 20 big commercials were moored up, all beflagged; mostly commercial, one of them even sporting an AH flag (AH being a well-known Dutch supermarket). We queried a skipper and it turned out that they had gathered because one skipper was about to get married, festivities taking up three days! A few days later the ‘just married barge’ overtook us, easily recognisable for all the flowers that had been heaped in the dinghy. Leaving the Canal latéral à l’Oise we went on to the Canal de l’Oise à l’Aisne, direction South-East, immediately having tp enter a lock. Over the doors there was a sign saying that the remote control could be had in the cabin on top; after this lock there were no more lockkeepers. We had to go up and so could only get hold of the remote once we were up. Apparently we had been spotted by a camera as the doors opened. We went into the chamber and nothing happened, the doors stayed open and we did not rise. So, we backed out, the doors stayed open and we rang each telephone number we could think of querying maps and guidebooks. In the end we found a cell phone number that got us through to the lockkeeper who was already on his way and got us through the lock. Apparently we should have been more patient and waited longer. Once up we got our remote that enabled us to operate all locks as far as the Canal des Ardennes. At a given point you push “up” or “down” and then the lock “knows” which doors to open; inside the chamber you lift a lever, thus telling the lock that you’re ready to be raised or lowered. Very simple and making a lot of keepers redundant. Afterwards there was a system where you had to turn a stake, hanging over the water, to activate the lock. The months of June, July and August were dedicated to having guests on board. Each time very pleasant, each time different and luckily the weather was okay or at least better than in Holland. On the Canal de l’Oise à l’Aisne we had four big boys for visitors, our son and three members of his band. They said it was “awesome” and the weather was perfect, so they went overboard many times a day even jumping from the roof of the pilothouse. After the boys had left we passed through tunnel number three on this trip, the Tunnel de Braye en Lannois (2,36km), That did not go unnoticed. Here everything went wrong and we still don’t know why; Murphy probably. We thought we would “do” this one, but the canopy had not been set low enough, than a wrong turn in the beginning set off a chain of events making it hard to get the ship on course, there was a towpath (the perfect thing to sidle up to) only on one side, the walls were rocky and uneven, this tunnel was narrower than the previous one, in other words: it went wrong! The edge of the canopy chafed the rocks (or the other way around) and though we quickly lowered it the damage had been done and the right-hand side had been filed off. On top of that we lost one of the big fenders up front. Luckily the tunnel keeper permitted Michel to retrieve it, walking back into the tunnel. They are expensive! By the end of the day we were dead tired but luckily we came to a nice spot, a pontoon just after a lock; very quiet and easy mooring. Just what we needed. As we sat in the twilight, enjoying a glass of wine, a peniche came along that had to moor as well. We offered him to shift and take our lines off, offering him access to at least one bollard, but there was no need for that. As there was no more traffic he just moored up across the canal and planned to set off at the earliest opening of the lock. Next day Michel repaired the tear with duct tape, which holds so far. It will be a winter repair. In the canals that connect rivers and that run alongside the river you sometimes go through a Pont Canal, crossing the river and each time it’s a special occasion. It makes you realise the enormous amount of work that has been put into digging and constructing the canals, now long ago. After the canal connecting the Oise and the Aisne we – logically - entered the Canal latéral à l’Aisne. It was a special occasion for us as we came across an important place from our past, the lock at Berry au Bac. Here the road via Reims to the Netherlands crosses the canal, there is a picnic table at the lock and to us it had been a stopover on our way back home after many a holiday where we had been sitting, looking longingly at the barges, thinking that one day ….. The Canal latéral à l’Aisne suddenly is called the Canal des Ardennes,which ends in the Meuse river. This last canal is really beautiful, very green, not too wide, lots of trees lining the banks alternating with nice meadows, offering beautiful vistas. Completely different from the Somme, where everything is more flat. skipper sits in the sun, handling the barge. At evening we notice it’s getting towards the end of the year, dusk comes quicker and there are beautiful skies, giving you with views over the stilled water. After the Tunnel de Bray we went down, but from Berry-au-Bac you have to get up in order to reach the Tunnel de St. Aignan, that being the summit where you reach the Meuse at Pont-a-Bar; from there it’s going down all the way. Over a stretch of some 125 kilometres, passing 45 locks we had risen about a 100 meters. 27 Locks are situated close to one another, like a staircase, stretching only 10 kilometres from Semuy to Le Chesne and getting you up some 80 meters. It’s entering and leaving locks all day long. On the canal we ran into a sailing boat, no mast. Those who think that we are cramped for space, take a good look at this picture. The ship, 12 metres, belongs to a couple that has been living on it for 9 years already. They crossed the Atlantic from the States, have been all over Europe and now they were doing the French canals, starting from the South in order to winterise in Paris. They will have their mast sent over. Once up we came to the next tunnel, a relief after Braye; plenty of space, only 200 metres, in and out before you know it and a beautiful picture to top it off. And then there was the river Meuse, quite a change after months of canals, now on a river, broad and an actual current. The Meuse is beautiful to sail, there being very few – none actually – commercials until you reach Givet. Next year we plan to sail the stretch from Verdun to Sedan, southerly from where we entered the Meuse. The landscape is either green or rocky and in between picturesque villages and beautiful houses. Because of the railway running alongside the Meuse it’s remarkably like the Märklin toy-railway. We’re now at the end of August, autumn is colouring the view; pity summer is almost over but a beautiful sight. The rocky sides are very popular with mountaineers, looking like little spiders attached to the cliff. Not my cup of tea, but I can imagine that you get a kick out of reaching the peak. After a very nice journey we came to the point where we had to make preparations for getting through the Ham Tunnel at Givet. The tunnel of Braye en Lannois being a summit, crossing the watershed between two rivers (the Oise and the Aisne), the Ham Tunnel is a shortcut, avoiding a big loop in the Meuse. This tunnel (600 metres) has a bad reputation because of the narrow dimensions, both height and width, there are no lights, the walls are very uneven, pieces of rock sticking out and no towpath either way. Our disadvantage is the sunroof being the width of the ship. We can lower it, but not narrow it. Because of our previous experiences we were determined to go in well prepared. Fenders along the railing and extra protection on the corners of the frame of the canopy, Be Prepared! At the lock just before tunnel the lockkeeper looked at us, showed us some mercy and said: no problem, I’ll just lower the water level a bit, and by the way, the dimensions shown in the map are not correct, there is more headroom! We felt a bit let-down. All together these measures were not superfluous because we fitted inside only just. Very slowly we went, no damage done, pffffffffffffff! From Givet to Namur there was more traffic, big commercials and industrial sites along the banks. 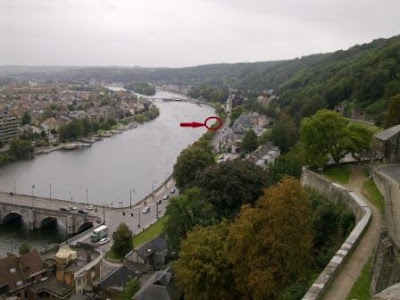 Namur is a nice town where we found ourselves a nice spot along the quay. Michel was a bit puzzled when he (I was off to Amsterdam for a few days) suddenly found a raft on the rudder. As it turned out it was a raft from the boy scouts, gone adrift. Part of it ended between the doors of the lock, causing some damage and the other part floated down the barrage, ending up on our rudder, no damage there luckily. After Namur rural is done, quays mainly and lots of industrial areas and big factories, although looking back at the nuclear plant at Huy – there are more of them along the Meuse - makes a very impressive sight. We passed by Liege (Luik), for now, because we wanted to get to Maastricht in time, it being Michels turn now to go to Amsterdam for a few days. Next time I certainly would like to moor in Liege, on a Sunday, because there is a very nice and big market there on a 2 kilometre stretch from the quay to the centre, lovely! There’s more towns and villages on the Meuse that we sailed past but that we will visit someday. You just cannot do it all at once and we still have a few years ahead of us, just as well. When getting to Liege we had a moment of tension – no photo’s, alas. We came upon a lock, having announced our arrival already to the lockkeeper who told us we had to wait a bit before entering. Michel revved down and then the engine stalled. Very annoying going downstream, windy weather and a big commercial right behind you. Fortunately there was a proper quay and we turned the ship towards it, floating on the current whilst radioing the commercial that we were in trouble; he immediately offered assistance when needed and we just hoped for the best. All went well, the commercial could get around us and a small yacht, that sailed behind the commercial, pushed us towards the quay, covering the last few metres, worth a picture. After that we did our Holmes & Watson act and by reason and deduction concluded that it had to be due to lack of gasoline, caused by suddenly revving down. Shouldn’t happen, but there you are. After half an hour the engine started right away, so far so good. Something else to add to our list of experience. Here follows a kind of cartoon about a big barge next to us in the lock, being inattentive whilst going down and they couldn’t get their rope off the bollard. The water level dropped over 13 metres and as they were testily trying to get the rope down the barge went down even faster leaving the bollard up there. the skipper climbing up with a boathook. Meanwhile we have reached the Netherlands and we have been in Maastricht for a few days already. From here we go along the Zuid-Willemsvaart to ‘s Hertogenbosch, thereafter to Dordrecht and finally to Haarlem where it’s time for a stop and to spend winter. I will write just one more entry in this blog, covering the last leg and next year there will be a new tale of our travels. The tomatoes were great, so was the lettuce but the broccoli and the cabbage were no great success. Next year more herbs and flowers; it’s fun to have a garden onboard and to hear all the comments from the land-lubbers.